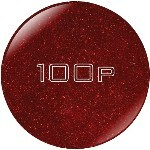 - Color: Red Sparkle All colors do vary somewhat from the picture shown. - Description: Finally, a spare ball any Track aficionado would be proud to have in his bag. Pick up those spares with ease. Likes:The 100P does exactly what it was designed to do.... go straight! The Red Sparkle color is fantastic and an eye catcher! Dislikes: Some customers want different colors? I personally like the Red Sparkle. I was having trouble coverting that damn 10 pin. I bowler in my league throws the Sparkly Cherry as we like to call it. I tried it a couple of times and knew I had to have my own. I am about a 85% converter now. There are still those times I get mad when I leave a stupid 10 and miss. Totally my fault not the ball!